The Woman Who Walked Into Doors, The Butcher Boy and Felicia’s Journey involve violence to women — domestic violence, the murder of a woman who is also a mother by a disturbed child and a serial killer’s pursuit of a young woman who becomes an agent in bringing about his suicide. Each of these texts concerns a subject that had previously been marginalized in serious literature. As such, each contributes to the sense of the timelag in which contemporary Ireland finds itself, discussed in Chapter 1. 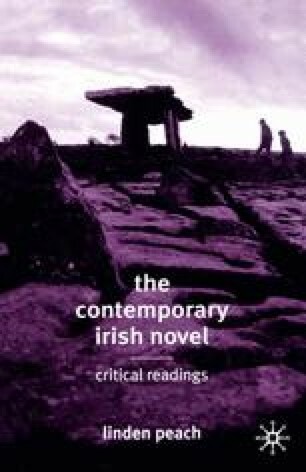 At one level, in giving a voice to previously concealed or half-admitted subjects, these novels present a critique of contemporary Ireland and Northern Ireland; of post-industrial society in Britain as much as Ireland in Felicia’s Journey; of Americanization and globalization in The Butcher Boy. But in the writing itself, there is an element that both attracts and repels the reader, especially in the exposition of sexually related violence. In other words, these texts situate the reader in an in-between position, uncertain for a while at least of what to make of them. This aspect is anchored not only in the choice of subject, but also in an interest in what emerges when we push these kind of subjects to the limit.